Not every Android gear, and certainly not the Nexus ones (nudge, wink, stock Android) come with built-in file and storage managers, and when they do, like devices on Marshmallow, it is usually a basic one. One of the nice things about Android is that you can do whatever you want with most any type of file that its inside of your phone, and even tinker with the system ones, if certain conditions are met, so having a more advanced file explorer and manager is often a good way to keep tab on your storage use and management. We say storage management, as some of the best file explorers in the Play Store have such a component, as they automatically sort and display your content by categories like photos, music, downloads, files, and can even list them by file type like PDFs, if that's what you are looking for. The storage managers also show how the free and used storage are distributed, and offer batch functions like deleting, moving or renaming. Check out some of the best file and storage managers you can currently get for Android. File Commander starts you off with a nifty Home screen which has your apps sorted in various popular categories like Music, Downloads, Archive or Documents, as well as a quick glance of your storage situation, both the internal memory, and the microSD expandable storage. A login profile allows you to set your app preferences and access them the same way across multiple devices. The File Commander storage manager lets you sort files by location, whether they are in popular cloud services, on local network addresses, in Downloads, or the phone storage itself. Besides a variety of sharing options and streaming methods like Wi-Fi Direct, Bluetooth and so on, there are plenty of small but nifty features to take advantage of, like a storage analyzer, recycle bin, recent files list, and the ability to work with hidden files or folders. 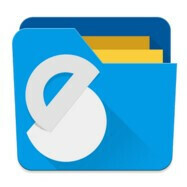 Solid Explorer by NeatBytes is not your average file manager. It recently went out of beta, and has wiggled its way into the Play Store with a two-week trial version, costing $1.75 afterwards. Granted, most file managers for Android are free, and your phone probably comes with one out of the box, too, but this is money well spent, considering what's on offer with Solid. The version that graduated from beta features an interface that is in accordance with Google's latest Material Design guidelines, and, besides the all-important Chromecast support, now has linkages to most every popular cloud storage service you can think of: Google Drive, Dropbox, Box, OneDrive, Sugarsync, Copy, Mediafire, Owncloud, Yandex, and even Kim Dotcom's Mega service with its free 50 GB of storage. The app can also serve as a front for your own private storage, be it with the FTP, SFTP, WebDAv, or SMB/CIFS protocols. When it comes to the Solid Explorer's interface, apart from being pretty in Material Design, you can preview files from two folders or categories in split screen mode, and drag and drop between them to move or copy. ES used to be the go-to file explorer for Android, as it is truly an all-in-one solution, but has become a bit bloated lately, and with an aging interface. It is still one of the most powerful file and storage managers there are, though, as, apart from all the basics, it offers FTP and wireless transfers, as well as built in cloud management for the most popular services out there like Dropbox, Box.net, Sugarsync, Google Drive, SkyDrive, Amazon S3, Yandex, and many more. No frills, good-looking file manager with Material Design that is light on resources, and pretty fast in operations. This File Manager by Gira Mobile can copy, move, rename, delete, find, share, explore, compress, and extract all major file formats. You can also manage numerous popular cloud storage accounts directly from the app. Besides all file management basics, this File Explorer by NextApp has a clean, well-organized interface, and adds extra features like a root explorer, or "FX Connect" which transfers files from phone-to-phone with Wi-Fi Direct. Another neat feature is "Web Access" that lets you control the transfer and management of files and media directly from your browser, including drag-and-drop for whole, or streaming music to your PC via Wi-Fi. The free version also lands you multiple window support, but if you splurge a bit more for the FX+ add-On, the possibilities are endless - from network file management support, through cloud services management, to creating 256-bit file encryption. Best file browser? That one which comes with phone..
ES used to be good but not anymore. It seems to be owned by some similar to Cheetah Mobile developer. Essentially it's bloated peace of crap. Try using it with the firewall on and you will see that it's trying to do something in the background. I would not trust these guys anymore. I have uninstalled long time ago and never looked back. I really like FX that's the one I currently use. Also PK Commander is pretty decent too. Yes, ES is owned entirely by Cheetah Mobile. But they already reduced the bloats on the free version. ES is the best I've used. Before that I used androzip pro and am so glad I switched. Indeed really great app. Don't mind to pay for quality product. Solid explorer works for me! es explorer is the best in that list for both rooted and un rooted phones. ES is definitely the best. File Commander and ES Explorer ftw. Xplore. Love it since Symbian days. It's dual pane beats the competition. used ES before, now it became extremely invasive with bloatware. like clean master. Why would i want all those permission checking notifications and cleaning features on a file manager? was looking for an alternative recently and there's one from ASUS which is really great. will try the one from GIRA. looks interesting. Solid explorer is the best for me..